Divining the future using the divination method of dowsing. Dowsing is a popular divination method of divining the future along with finding ley lines, water, gold and silver or lost or hidden items. There are two major forms of dowsing – one using dowsing rods and the other using a dowsing pendulum. Dowsing for ley lines, sources of water or other materials such as precious metals is usually carried out by using dowsing rods (made from metal) or a Y shaped branch from a tree or bush. For divining the future or other divination purposes the use of a dowsing pendulum is employed. A dowsing pendulum, usually formed form natural crystal is suspended on a chain and the way it swings is interpreted to give insight and information. You can make a dowsing pendulum from any natural material such as wood, metal, stone etc and suspend on a piece of thread. A popular method is to use a gold wedding ring suspended on white thread. Specifically formed pendulums using crystal or metal may give more accurate answers. 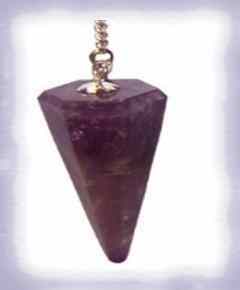 Cleanse the dowsing pendulum to align and attune to your energies. 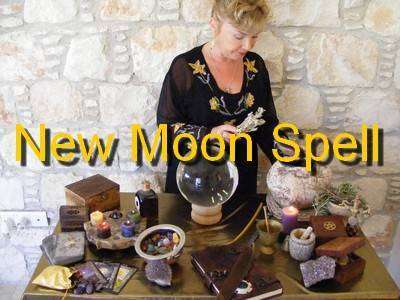 This is best done by allowing the pendulum to soak up the moon's rays by leaving it outdoors during a full moon period. Another way to cleanse and energise the pendulum is to place it on or near an amethyst crystal cluster overnight. Before use hold the pendulum and ask it and the Universe to provide you with insight, knowledge and information for the greater good. You can either stand or sit. If sitting, rest your elbow on a table. If standing outstretch your arm in front of you. Use your dominant hand to hold the dowsing pendulum. Hold the dowsing pendulum chain or thread between your thumb and forefinger allowing the pendulum to hang free. Let it settle until it is motionless. To determine how your energies will affect the pendulum ask a series of 'test' questions. This will determine which way the pendulum will swing to answer you specifically. Ask some questions that you know the answer will be 'yes' and some that you know will be 'no'. For most people, generally when the pendulum moves in a circular clockwise motion the answer will be yes. Anti-clockwise usually means no. A swinging back and forth can mean indecision, caution or reluctance to answer that specific question. Ask a question verbally or mentally. Wait a few seconds for a reaction. Your questions must be uncomplicated, clear and direct with a possible answer of either yes or no. It might be necessary to break a bigger question down into a number of simpler questions. If you haven’t already check out my other pages on the personal Spells Cast For You by me, Alizon, on your behalf.